A rendering of Little Matterhorn at 1am. This paper presents a physically-based model of the night sky for realistic image synthesis. We model both the direct appearance of the night sky and the illumination coming from the Moon, the stars, the zodiacal light, and the atmosphere. To accurately predict the appearance of night scenes we use physically-based astronomical data, both for position and radiometry. The Moon is simulated as a geometric model illuminated by the Sun, using recently measured elevation and albedo maps, as well as a specialized BRDF. For visible stars, we include the position, magnitude, and temperature of the star, while for the Milky Way and other nebulae we use a processed photograph. Zodiacal light due to scattering in the dust covering the solar system, galactic light, and airglow due to light emission of the atmosphere are simulated from measured data. We couple these components with an accurate simulation of the atmosphere. 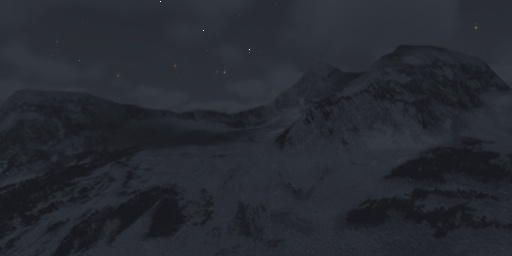 To demonstrate our model, we show a variety of night scenes rendered with a Monte Carlo ray tracer. Reference: Henrik Wann Jensen, Fredo Durand, Michael Stark, Simon Premoze, Julie Dorsey and Peter Shirley: "A Physically-Based Nightsky Model". Proceedings of SIGGRAPH'2001.